For the avid TV fan, restoring a shredded document must be a no brainer. Often the protagonist armed with only a roll of tape will assemble hundreds of documents with ease. As maintaining the upmost security for unfinished experiments is an extremely important task for Scientific Ameriken, the possibility that such a glaring security hole exists must be closely examined. Here, Scientific AmeriKen will attempt to restore two documents, one hand shredded and the other machine shredded, to shed light on what is real and what is fiction in the world of physical document recovery. Numerous TV shows demonstrate the ability to reconstruct shredded documents, most recently in the detective show Limitless. The show featured an individual who utilizes mind enhancing substances to solve crime. Although Scientific AmeriKen will only be utilizing caffeine to enhance mental efforts, it is the hypothesis of this experiment that document recovery is indeed possible. Scientific AmeriKen also notes a successful reconstruction of a 1000 piece puzzle preceded this experiment which may have artificially enhanced the confidence while formulating the hypothesis. Materials for this experiment include two printed documents (displayed on right), timer, a shredder and a table. 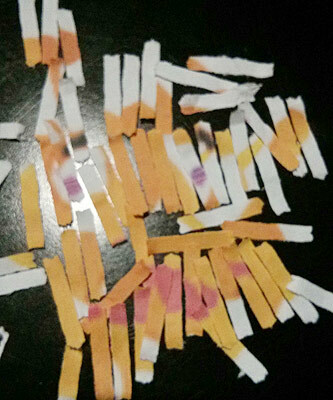 Document one was taken in hand and torn into multiple pieces (Right and Down). A timer was started and repair process then commenced. 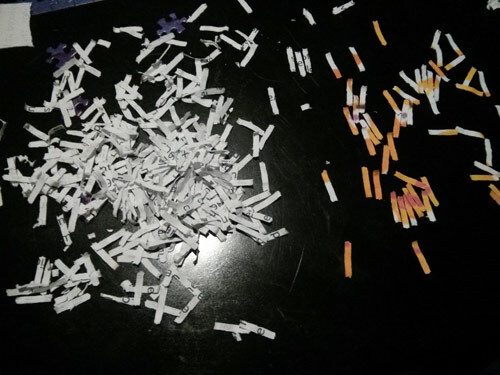 Following this test, a second document was then fed into a shredder (below) and shredder fragments (bottom right) were then recovered for reassembly. A timer was initiated from the assembly of the first two pieces and continued until the full assembly of the document. 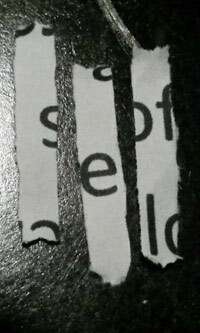 Although assembly of the torn document was much more difficult than expected. Successful completion did occur at 27 minutes and 13 seconds (image below). At approximately 20 minutes, frustration and despair set in causing Scientific AmeriKen to refer to the original document to aid in the reconstruction. It is the Scientific opinion of Scientific AmeriKen that although this action accelerated completion of the restoration, completion likely would have occurred anyhow. 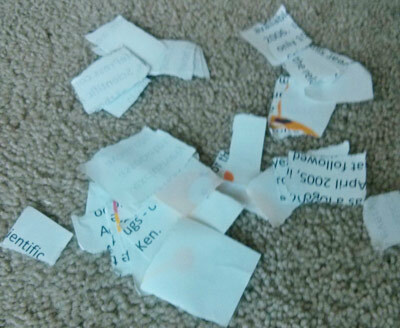 Next, Scientific AmeriKen attempted to assemble the machine shredded document (image below). After approximately 30 minutes, Scientific AmeriKen waved the white flag of surrender. 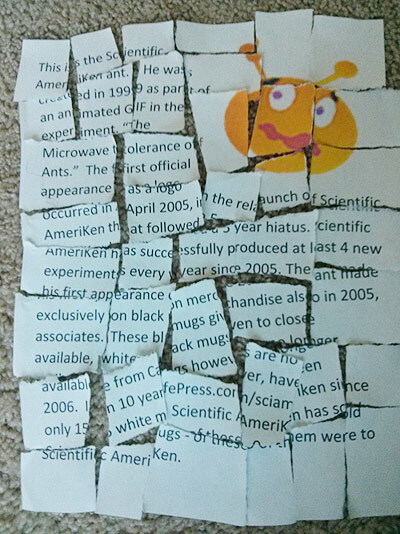 Although there was marginal success found in the restoration of the ant, the shredder appeared to separate the text into nearly individual letters - it was determined that because of this, Scientific AmeriKen would be able to write whatever text he wanted, thus the original document would be protected. Sadly, Scientific AmeriKen succumbed to the enormity of the task at hand. With even pieces of the ant being completely interchangeable it was clear that any attempt at assembling the lettering would only result in insanity. Although reconstruction of the ant was scant at best, this endeavor raises the possibility that a document with mixed graphics and text may lead to greater success during reconstruction. More encouraging was the success in reconstructing the hand torn document. Not only does this demonstrate that secure documents should not be simply ripped up, but also, this also shows a quick method to produce a time consuming puzzle when needed. Although the experiment was enjoyable, it turns out that the topic has been well reviewed by Slate.com, and in some cases, the task is better handled by scanners and computer assembly algorithms, which in the opinion of Scientific AmeriKen, is a strategy that misses out on the fun!